Sights and Sounds. At halftime of this game, the operators running the 1 Golden Center jumbotron decided to check in on the other NCAA Tournament games going on around the country. One of those games happened to be the exciting one-point battle in Greenville between North Carolina and Arkansas. After showing a couple minutes of mostly dead-ball action, the jumbotron abruptly cut away to a massive URI symbol (presumably for the cheerleaders coming on to the floor). That decision was met with an arena full of boos, as fans wanted to see the end of the other game. The compromise that was almost immediately instituted was to picture-in-picture the game for the satisfaction of the fans. What’s Next. Oregon moves on to the Midwest Regional in Kansas City, where it will face #1 seed Kansas in its own back yard. 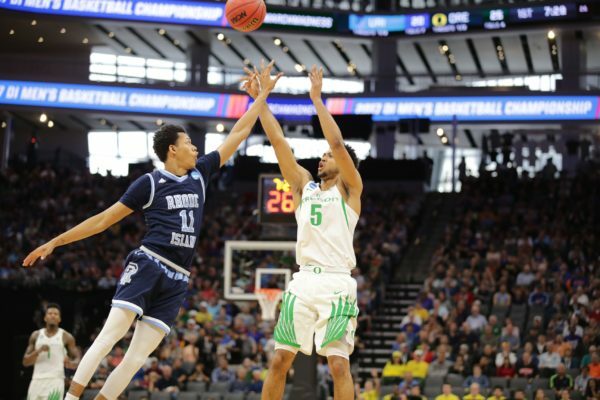 Rhode Island heads home with its head high after winning its first NCAA Tournament game in 19 years and knowing that it represented itself very well this weekend in Sacramento. This entry was posted on Sunday, March 19th, 2017 at 7:45 pm by rtmsf	and is filed under 2017 ncaa tournament, feature, rushed reactions. Tagged: Dillon Brooks, ncaa tournament, oregon, rhode island, Tyler Dorsey. You can follow any responses to this entry through the RSS 2.0 feed. You can leave a response, or trackback from your own site.